Wondering what it might be like to take an exhilerating tour of Hawaii from the comfort and safety of a custom Jeep? 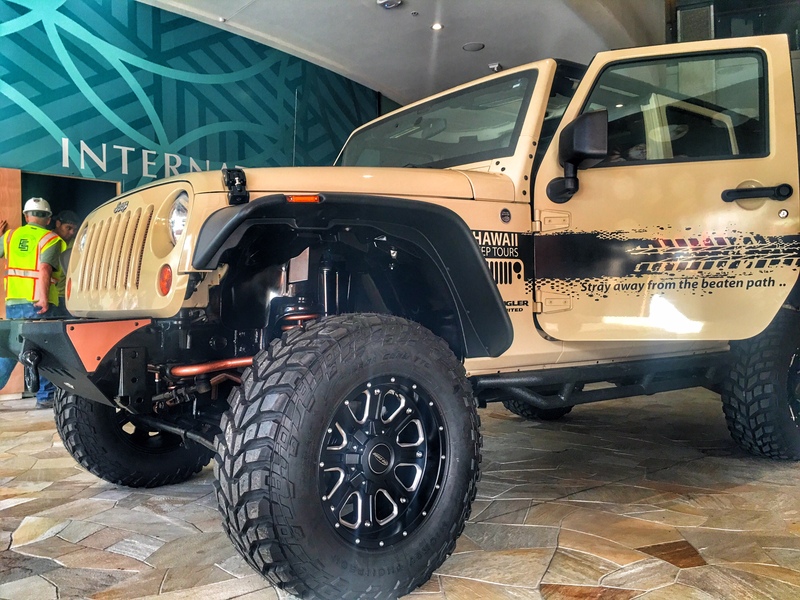 Just head to the newly-redesigned International Marketplace in Waikiki and “take a ride” in the star-attraction: A full-sized, custom Jeep that’s the centerpiece of the new Hawaii Jeep Tours display. The state-of-the-art display officially went “live” on Thursday, October 13th and is located at the Kuhio entrance to the Marketplace. Accompanied by a steady stream of intrigued media, guests had the opportunity to pick-up informational brochures, make tour reservations, and meet the company’s local, knowledgeable tour guides who will staff the venue during business hours. And, of course, the custom Jeep made for a one-of-a-kind photo op! So, what kind of tours are available for booking? Oahu Circle Island Tour: An eight hour tour for those who want to see all the best landmarks, scenic lookouts, and points-of-interest on Oahu. Oahu Half Circle Island Tour: Four hours of touring Oahu, with stops at featured venues, such as Hanauma Bay and the Lanai Lookout. If you're wondering what it's like to tour in style, take a seat in the custom Jeep at the Hawaii Jeep Tours display at the International Marketplace in Waikiki. Kona Culture and Coffee Tour: Kona is best known for its unique history and famous coffee. Combine the two on this four hour long tour. Hawaii Five-0 Tour/Hawaii Five-0 Superfan Tour: Both tours give guests an up-close and personal, behind-the-scenes look at this popular TV show filmed in Hawaii. Aloha Plate Hawaii Food Tour: For four and a half hours, you’ll indulge in some of the most fantastic food in the Pacific Rim. Experience Hawaii through its cuisine during this unique tour. Pearl Harbor Experience: Choose how in-depth you’d like to go when you choose from three different Pearl Harbor tours. Get a glimpse of the past and experience the Pearl Harbor of WWII during this informative and exciting tour. Escape Waikiki EZ Waterfall Tour: This is a three hour long tour for families of all ages. Take a dip in the refreshing pool underneath a hidden waterfall and hike through a Hawaii rainforest. Get all the information you need and meet the friendly Hawaii Jeep Tours guides when you stop-by and visit the new display at the International Marketplace. And, mark your calendar for the Grand Opening on-tap for Saturday!